Warner Bros. and Rocksteady have released a new Batman: Arkham Knight trailer. The upcoming video game, which takes place one year after the events of Batman: Arkham City, finds the titular superhero squaring off against Scarecrow, who has united Batman’s enemies in a plot to finally kill The Bat. To make matters more complicated, the mysterious “Arkham Knight” is in the mix. The question this trailer poses is, “Can you sell a Batman game without the Joker? 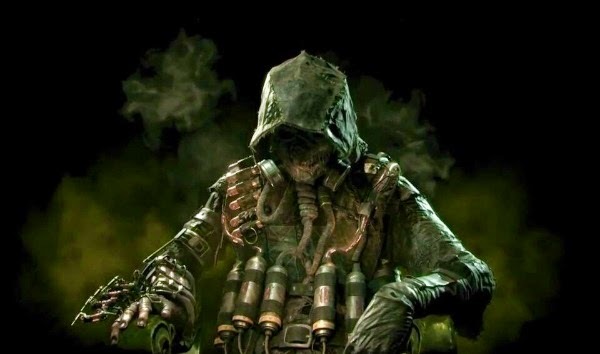 Is Scarecrow formidable enough to take point?” Judging by what this trailer presents, Batman will certainly have his work cut out for him, and Scarecrow is menacing enough. He’ll never be mistaken for the Joker, and I’m sure there are fans who believe that other villains should be taking the lead. But I’m fine with what Rocksteady has set up for the conclusion of the Arkham trilogy, and I’m hoping that the game (which will be rated “M”, surprisingly) will deliver. Batman: Arkham Knight brings the award-winning Batman: Arkham trilogy from Rocksteady Studios to its epic conclusion. Developed exclusively for the new generation of consoles and PCs, Batman: Arkham Knight introduces Rocksteady’s uniquely designed version of the Batmobile. The highly anticipated addition of this legendary vehicle, combined with the acclaimed gameplay of the Batman: Arkham series, offers gamers the ultimate and complete Batman experience as they tear through the streets and soar across the skyline of the entirety of Gotham City. In this explosive finale, Batman faces the ultimate threat against the city that he is sworn to protect, as Scarecrow returns to unite the super criminals of Gotham and destroy the Batman forever.